I've been asking for a Silhouette Cameo machine for a while now, and I was pleasantly surprised to receive one from the hubs this past Mother's day! I know the sky is the limit with the projects I can do with this cool machine, but my main objective in wanting one is for Heat Transfer Vinyl. I love the idea of further customizing my handmade garments with images and words using vinyl. I was especially pumped to use it for clothing for my son. I feel like my little guy does not get nearly as many handmade garments for several reasons, the main one being that great fabric and patterns just aren't as prevalent for boys as they are for girls. Finding boyish print fabric that isn't too expensive, too childish, or too plain is a challenging task! Stripes and solids, albeit boring, are often what I am drawn to for my son. 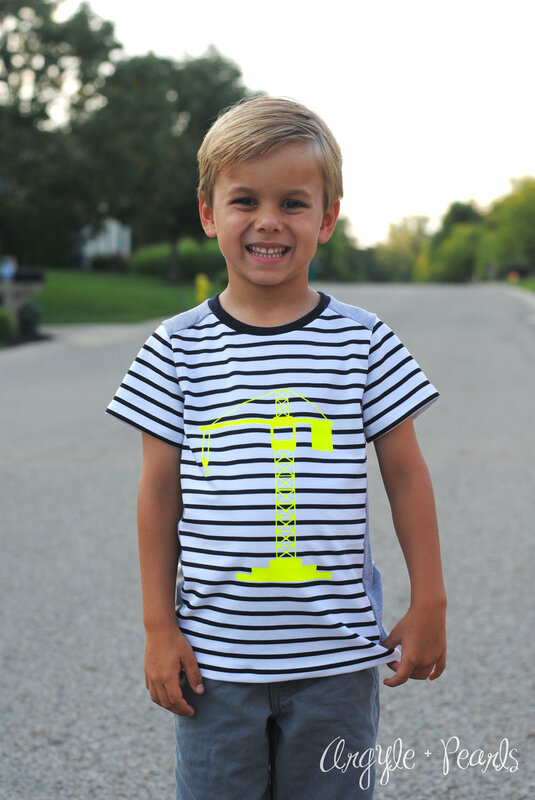 Enter, heat transfer vinyls and the ability to make unique and interesting shirts for my son without having to hunt for the perfect boy print fabric! I knew the Swiss Army shirt (from New Horizons Designs) would be a staple pattern for my Heat Transfer Vinyl projects for my son. I already adore this pattern since I could use woven fabric for the front and back, which also opens up lots of options for boy prints! I also really love that it has side and shoulder knit fabric panels that I can use an accent or coordinate fabric to add more interest instead of just a plain basic tee. For this version, I opted for a stripe main shirt with light grey side and shoulder panels, all knit fabrics. These black and white stripes are one of the club line of fabrics from Raspberry Creek Fabrics that I use ALL. THE. TIME. because they are so perfect! I let my son choose the vinyl color, although I suspected it would be either this neon yellow or neon orange. I LOVE how the neon yellow pops against the black and white stripes! After searching high and low for the perfect cut file of a tower crane, I finally gave up and created my own using a vector file I purchased. I learned so much with this process, but still have a ton left to figure out!!! I love that when I can't find exactly what I want, I know I can somehow create it! I'm starting to plan my son's wardrobe for the fall, and so far there are a bunch more Swiss Army shirts planned! 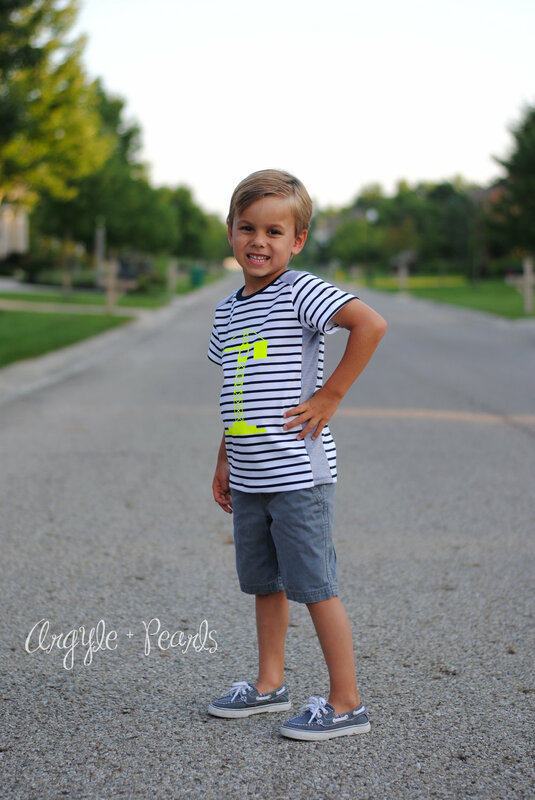 He's starting Kindergarten this year, so really want to make some awesome stuff for him to head off to school in! The Swiss Army shirt also has a bunch of other awesome options like a button placket, polo collar, long sleeves, etc, so its pretty much the only pattern I'll need for him! Its the perfect canvas for all your boy sewing needs!